My last post was about how I had difficulty in the language used to describe evolution (https://confessionsofayec.wordpress.com/2011/06/20/the-language-of-evolutionists/). This post is about items in nature that caused me the same issues. There are some amazing things that happen in nature and sometimes they seem to defy any sense of logic. Trying to imagine how they could happen through chance mutation sends my head in a spin. Yet, somehow they did. Its not too much of a stretch to imagine and suggest that elephants eating fruit from trees, moving on and then eventually excreting the seeds of said fruit several miles away assists with the dispersal of those fruit trees. In fact there are several fruits that benefit from elephants this way and its been estimated that the African savannah elephants disperse a third of the fruit seeds that get germinated. This makes elephants extremely important to the ecology of the areas they roam. One can only image what the impact of their severely depleted numbers will have. Why would evolution do that? Surely evolution seeks to make life easier and better; constraining a seed to such a specific germination requirement seems rather limiting. The parasitic wasp in question in quite well known, it paralyses a caterpillar and lays its eggs inside the body. The caterpillar is kept alive but immobile while the eggs incubate and hatch. On hating the caterpillar became the first meal for the grubs of the next generation of parasitic wasp. What is more impressive is that the wasp knows where to find the caterpillars because of the scent given off by the plant leaves when they are eaten. Damaged leaves give off a scent, anyone who has mowed a lawn will know well the scent of freshly cut grass. All across the plant world, leaves give off scents when they are damaged. The wasp is able to tell the difference between the scent from a damaged plant and the scent of a plant being eaten by the Heliothis virescen caterpillar, its preferred victim. Yes, the plant gives off a different scent when its being eaten by this caterpillar, well it could be any caterpillar I guess. The wasp knows this scent and comes in for its nasty business. Rather than the plant specifically calling to the wasp for help, its far more likely that the wasp has learnt to recognise this specific scent as the indicator of the presence of its victim. So far, all reasonable from an evolutionary perspective, though its precisely the sort of thing I’d have brought up previously as something that can’t happen by mistake; especially the wasp laying its eggs in a caterpillar bit. However, this is where we go a little surreal. The broad-leaved helleborine orchid gives of the same scent, or at least one that’s close enough, that attracts the wasp. The wasp finds no caterpillar, but it gets a good mouthful of sweet nectar and helps the orchid along with its pollination in the process. How utterly wonderfully bizzar! I love it! I am sure I could find many more examples if I tried a bit harder, but these two will have to suffice as I think they serve to make my point well enough. The thing is, odd things and coincidences happen by chance all the time and when you have the meandering randomness that is evolution, then there will be some strange and hard to explain things that happen simply as a by product of that. Oddities spread throughout nature are not at all evidence against evolution, quite the opposite. Yet, when I was in the mindset of not accepting evolution, this was exactly the sort of thing that set me back. One of the major sticking points for me was the language, words and phrases that I’d hear used when describing evolution. The most problematic one is the use of the word ‘design’. Its used when describing the eye, a bird’s beak and many more anatomical components. Each time I’d hear it I’d fume inside and imagine myself vocally admonishing the presenter of whatever television programme had daring to suggest that a mindless random process like evolution could ever design anything. Another major bugbear was when the evolution process was described in words that seemed to imply an intelligent guiding process, as though the end result was already known and evolution worked its way making changes required to achieve that result. Again, my angry brain voice would be screaming at the television “evolution is a benign process that’s not even real you twonk!”. So I would huff and puff my way through nature programmes. It’s a wonder I didn’t give up watching them really. 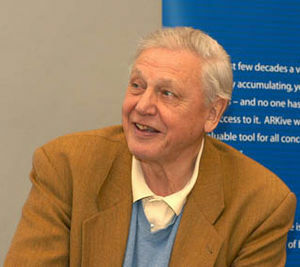 Then of course there is our very British institution, Sir David Attenborough. No matter what the programme he was fronting, no matter how interesting or relevant the subject matter was, he would always slip in the fact of evolution and the millions of years it took for such and such to evolve or form or whatever. It didn’t seem to matter if the evolutionary process was relevant to the piece in question, it was brought up anyway. Presumably because nature documentary equals “must mention evolution”. Given my Zambian upbringing, anything nature that involved centralAfricaor any savannah animal that I was familiar with was pretty much mandatory viewing. So it goes without saying that I was exposed to a fair number of such phrases and their automatic affect on my blood pressure. The examples given above are not in any way an exhaustive list of the language and phrases used when describing evolution that can cause, not just frustration, but also confusion. Thankfully, I’m over that and I can now enjoy nature documentaries with a freedom and freshness that’s genuinely enjoyable. I do still notice these one offensive phrases and I do often wonder if I was never alone in getting uppity over them. I am sure that if they caused an intellectual problem for me, they did for others too and perhaps editors and science journalists should pay more careful attention to the language used to explain evolution. They’ll never stop upsetting the staunch creationists, but if the language was less emotive and more factual it might help with righting the misunderstandings that cause creationists to react so and might even help them along the road to acceptance. After all, if they are watching the programme, kits because they have an interest in the subject. Sometimes I try to rephrase them in my head in a way that explains the point better. Can a Christian Lose their Faith? Well obviously yes, since I now call myself an atheist, having been a Christian for many years. Yet the answer is not at all that cut and dried. I once had a discussion with a close friend of mine about this very question and we disagreed very strongly with no common ground at all. I argued, that yes, one could lose their faith. One could come to the conclusion, for various reasons that they didn’t want to be a Christian any more and actively reject their old Christian life. Or one could ‘backslide’ as we called it in those days, and eventually fall away from faith. My friend argued the opposite; that a Christian could not lose their faith. His argument was that the action of the Holy Spirit in the life of a Christian would be an active block against desertion of faith. His point rang bells with me, because I had once held that view too. As a young child at boarding school inZambia, I distinctly remember having discussions with school friends along the lines of ‘Once you are a Christian and God has you in the care of His hands, then He will never let go and you will always be a child of His’. I’m paraphrasing there, but the basic synopsis is that once you are a Christian, then its just not possible for you to unconvert. It’s a once only irreversible decision. I’m not sure where the original idea came from, but it was reinforced by the conversations that children have between each other on the playground. Years later, here I am having this discussion again, but from a very different perspective. I wonder what had changed. At the time we were both very definitely Christians. He is now a vicar and I am now this anonymous internet blogger spouting my stuff as if its important. He probably reaches more people weekly than I do. What if I do it? Anyway, during the conversation I posed the hypothetical suggestion that at some point in the future I would abandon my faith. Of course I knew it would never happen, but lets ignore that and just pretend it does, oh the irony! My friend’s retort was that if that were to happen he’d question if I was a proper Christian to start with. Ouch! But of course that would never happen because he knew I was a proper Christian. I wonder how the conversation will go when (if?) he finds out about my change of heart. I guess for the moment I’ll just have to ponder, but eventually he’ll find out and I am a little bit curious as to how the conversation will go. DNA evidence now makes it abundantly clear, there is simply no skirting around it, Adam and Eve never existed. This month’s Christianity Today has an article titled The Search for the Historical Adam (http://christianitytoday.imirus.com/Mpowered/book/vchto11/i6/p29). Its clear from the article that a literal interpretation of Genesis is discouraged. The wider implication of this, the fall of man with the original sin, is not covered in as much detail as I would like. The article states that scientific evidence demonstrates that not only did the human population that’s alive today not descend from a sole pair of humans, but that the genetic history goes back considerably longer than 10,000 years. The estimated minimum modern human population is a few thousand individuals several tens of thousands of years ago. Unless one wants to believe in a god that created a pre-aged world with a pre-defined historical DNA record, there simply is no way that a literal interpretation of the Adam and Eve story is possible. Also not mentioned in the article is the authenticity of the Garden of Eden. DNA evidence puts man as originating from Africa whereas the location of Eden as described in the bible would put it somewhere in The Middle East. The Christianity Today article is referenced by BioLogos (http://www.biologos.org/blog/biologos-and-the-june-2011-christianity-today-cover-story/), where the scientific fact of the non-existence of Adam and Eve is also acknowledged. The BioLogos article ends with a call for theologians to step in and sort the issue out. I find it interesting that neither article makes a big issue of the scientific evidence; nor do they speculate on what the solution may be. What I wanted to read was a categorical stating of scientific facts and a rousing challenge to Christians. Given that both organisations are devoted to the Christian faith, I guess there was no chance that was going to happen. The acknowledgement that Adam and Eve never existed is going to have to come from the Church eventually. This is not an issue on which it can bury its head in the sand. The thing is, this acknowledgement produces a big problem. Without Adam and Eve, there is no original sin, no first murderer, no ordained punishment condemning women to a painful childbirth and no requirement for Jesus’s sacrifice. No wonder the articles are reluctant to take a stance on the matter. For me, it reaffirms that my decision to exit Christianity was the right one. This is not a problem I’d want to be wresting with as a Christian. One of the most painful and unhelpful experiences I had as a believer was when an online discussion with some friends about Christianity and evolution turned ugly and I ended up feeling ganged up on and very definitely unloved. For background, this on-line groups of friends is a small cluster of people who, more than a decade ago, got together to talk about cars and meet up on the occasional track day. Most of them I have met on several occasions and all of them are decent people, even if I don’t know them well on a personal level. There are none who I consider unworthy of friendship, though my friendship status with them varies, as it must given that the vast majority of our dealings are on a private on-line forum where much discussion is reduced to humour and sarcasm. For me, this on-line discussion served a good purpose in that it enabled me to share a common interest, that of cars and track days, and to engage in general random and irreverent chatter outside of my work colleague and church friends. So for these reasons I did not advertise my Christianity, not because of embarrassment; but because I did not consider it relevant to that context. I intended to behave as much as I could as a Christian and let me actions speak. Of course it eventually came out that I was a Christian, but I still avoided talking about it as much as possible because this was supposed to be my safe place away from that world. One day, for reasons I no longer remember, a thread was started that ended up talking about creationism and I let my colours fly. I stated my young earth creationist credentials and my objections to evolution. Understandably the flood gates opened and those who were passionate about the science of evolution waded in with facts and evidences. It all started well enough, but it wasn’t long before insults of poor intelligence flew in my direction. In the end I gave up and made it clear I would not discuss the subject again. The reality was, I was hurting inside. I was angry that my points were either not understood or misrepresented and that my bigger wish, to have understanding and respect between opposing viewpoints was utterly dashed. No way was I going to open myself up to that torrent of ridicule again. The bigger side effect of this discourse was that it hampered my acceptance of evolution. At that time I was likely open to sensible discussion about evolution, but it didn’t happen. In fact I probably wanted (or needed) one. Sadly the conversation was very uneven, with just me on my side and several on the other. It only took a couple of those people to throw insults to create the offense that happened. It would be some time before I would be prepared to listen to arguments for evolution again. When it happened it would be on podcasts. I’ve not come clean to these friends on my acceptance of evolution (or my new found atheism) because I don’t think its fair to be open about it until my personal issue on coming out to with my wife is resolved (https://confessionsofayec.wordpress.com/2010/11/15/when-and-how-to-come-clean-on-atheism/).